A Maryland renewable energy rebate program established in 2012 has provided assistance to nearly 3,000 to purchase and install cleaner, modern wood and pellet stoves. The program was designed to help rural families, who were least likely to benefit from solar and other renewable energy programs. The state has invested $1.88 million dollars, or an average of $664 per home. The average purchase and installation costs of a stove is often around $3,800, so the state would be providing less than 20% of the price tag for a significant reduction in a home's annual fossil fuel footprint. The Maryland Energy Administration, who manages a suite of renewable energy incentives, runs the program. With this program, the MEA cannot exactly track the amount of fossil fuel that the program has reduced, which hinders the ability of regulators to track data as they can with the solar and other rebate programs. Of the 2,845 stoves purchased through the program, 2,425 or 85% were pellet stoves. To be eligible, pellet stoves have to emit 2 grams an hour or less, and wood stoves 3 grams an hour or less, well below the federal EPA limit of 4.5 grams an hour. Pellet stoves are eligible for a $700 grant and wood stoves $500. “We are pleased that this program steers so many people towards pellet stoves and ensures that the installation is done professionally,” said John Ackerly, President of the Alliance for Green Heat, a Maryland based group that worked with MEA to establish the program. The program does not require residents to turn in an old, uncertified wood stove to participate in the program. However, some retailers report that nearly half of their customers who use this program turn in an old stove that is recycled. During 2015, the program experienced its highest participation rates, providing grants for 1,036 stoves, 904 of which were pellet stoves. “A $3,000 pellet stove installation can reduce fossil fuel usage by as much as a $15,000 array of solar panels,” said Ackerly. “And increasingly, we see families who have solar panels also installing pellet stoves so that they can use renewable energy for both their electric and heating needs,” he added. Updated, April 12, 2019: Massachusetts has developed the first wood stove change out program in the country that recognizes the value of automated stoves and stoves that disclose their verified efficiency to consumers. The program details, updated in April 2019, offers Massachusetts residents between $500 and $3,250 for upgrades, depending on the stove and income level of the family. The Commonwealth Woodstove Change-Out Program has committed $1.8 million in funding for change-outs from 2017 through 2019. The 2017 program represents the sixth round of funding since the program's launch in 2012. The program has helped more than 1,400 residents swap out their non-EPA certified, inefficient stoves for newer, cleaner models, and approximately 500 of these rebates went to residents earning less than 80 percent of the state median income. The program is like scores of others across the country, but Massachusetts is the first to give an additional rebate of $500 for pellet stoves and $250 for wood stoves that are above 65% efficient (actual tested efficiency reported to the EPA). Most manufacturers do not disclose the actual efficiency of their stoves but provide exaggerated, misleading efficiency values on their websites. The program is run the by Massachusetts Clean Energy Center (MassCEC) in coordination with the Massachusetts Department of Energy Resources (DOER). It is also the first program that gives an additional rebate for stoves that have automated features and control the airflow with sensors or other devices, providing a cleaner burn for the consumer. Most stoves are eligible for a $500 - $1,250 rebate depending on how clean they are, but four automated stoves qualify for a $1,500 rebate, or a $2,750 rebate for income-qualified families. Three of the four automated stoves also qualify for an additional $250 that have efficiencies above 65% that are verified by the EPA. The additional rebate for automated stoves may only come to $250 or $500, but the recognition of this new class of stoves is a significant step for the stove industry. These stoves are more known in Europe, but in the US, the terminology, rationale and classification of automated stoves is still in its infancy. One of the next huge steps for wood stoves is to have them designed and tested with cord wood instead of 2x4s and 4x4s, the fuel they are designed for and tested with today. In the next 2 or 3 years, change-out programs are likely to also start awarding additional rebates for stoves made by manufacturers willing to start designing and testing with cord wood, something that the new EPA stove regulations are making possible. The EPA requires all stoves to emit 4.5 grams of particulate matter per hour or less, but the Mass program only allows stoves that emit under 3.5 grams. The list of stoves eligible in Mass is 24 pages long and explains their rebate eligibility. The Maine, Maryland, and New York programs also require lower gram per hour limits than the EPA. 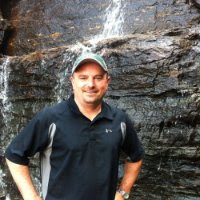 The MassCEC does not allow gas stoves to participate in the program because Massachusetts statute prohibits them from providing incentives to fossil fuel use, said Peter McPhee, Renewable Thermal Program Director at the MassCEC. 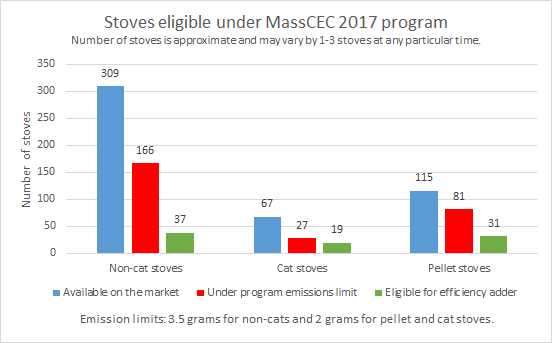 Non-catalytic stoves: The Mass program is more aggressive than any other change-out program in providing bigger incentives for cleaner wood stoves. They offer $500 for non-cat stoves that emit 3 – 3.5 grams per hour, $1,000 for stoves from 2 – to less than 3 grams per hour and $1,250 for stoves that emit less than 2 grams per hour. Of the 309 non-cat stoves on the market today, 166 are eligible for some level of rebate because they emit 3.5 grams per hour or less. Catalytic stoves: To be eligible, a catalytic stove must emit 2 grams per hour or less. Of the 67 cat stoves on the market, 27 are under 2 grams and eligible. Catalytic stoves under 2 grams get a $1,000 rebate, $250 less than a non-cat stove that is under 2 grams. Pellet stoves: Like catalytic stoves, pellet stoves must emit 2 grams per hour or less, and are eligible for $1,250 (plus an additional $500 for an efficiency bonus, if they have a verified efficiency.) Of the 115 pellet stoves on the market, 81 are eligible as they emit 2 grams an hour or less. Providing similar rebates for wood and pellet stoves is increasingly rare as most change-out programs give 50 – 100% higher rebates for pellet stoves, compared to wood stoves. Nationally, the median rebate for a wood stove is $600 for wood stoves and $1,000 for pellet stoves. Automated stoves: Four stoves qualify as automated under this program: The Quadra Fire Adventure II and Adventure III, the MF Fire Catalyst and the RSF Delta Fusion. All of these stoves break new ground in operating cleanly while drastically reducing the margin of human error, which is considerable. More European or American automated models are likely to come onto the market in coming years. A number of states are trying to include efficiency in their change-out programs, but Mass is the first to do so. The underlying problem is that before 2015, stoves were not required to disclose their efficiency. Today, only a quarter of wood stoves on the market disclose their actual, verified efficiency. Stoves certified since May 2015 are required to test for and disclose their efficiency. Some companies have taken the extra step and voluntarily disclosed their actual efficiencies and do not exaggerate their numbers on promotional materials. If a program only gave rebates to stoves with verified efficiencies, the consumer would only have 125 out of 500 stoves to choose from. So, Mass chose not to make efficiency disclosure a requirement, but gives a $250 or $500 bonus for stoves that meet a minimum efficiency of at least 65%, well under the average stove efficiency which is around 70%. This will likely drive sales towards manufacturers who disclose their efficiencies and will also educate consumers about the importance of selecting highly efficient wood and pellet stoves. An additional $500 is significant. More manufacturers may start to disclose their efficiencies to be eligible for higher rebates as other states begin to recognize efficiency as Mass did. Of the 38 pellet stoves that disclose actual efficiencies, four are not eligible for the change-out program as they emit more than 2 grams an hour, and 3 are not eligible for the $500 efficiency adder as they are less than 65% efficient. This leaves 31 pellet stoves eligible for the $250 adder. Of the 23 catalytic stoves with verified efficiencies, four are not eligible as they exceed 2 grams per hour and one of those four is under 65% efficient, leaving 19 eligible for the $500 adder. Of the 66 non-cat stoves with verified efficiencies, 17 exceed 3.5 grams and are not eligible for the program. Two others are not eligible for the $250 adder as they are under 65% efficient. This leaves 37 stoves eligible for the $250 efficiency adder. Residents must have the new stove installed by a Participating Stove Professional who follows the guidelines of the program, which includes ensuring the old, uncertified wood stove is destroyed. There are currently 32 participating stove retailers, four of which are outside of Massachusetts and three of which are chimney sweep businesses. However, MassCEC says that they expect a total of 40 – 50 in coming weeks. They are likely to be NFI or CSIA accredited, but are not required to be. Residents are encouraged to find installers who are. Programs that require residents to work with participating retailers can effectively limit the range of stove models that they can buy. Retailers like to install stoves that they sell, so they can make profit on both the sale and the install. But some eligible stoves available at Home Depot can offer real bargains particularly for lower income families. Some participating retailers or chimney sweeps may install stoves purchased elsewhere by consumers, but some may decline to do so. Many eligible wood and pellet stoves are made by small companies and a few are made by companies that sell direct to consumers. They may have a harder time participating in this change out-program. The rebate is provided to the participating retailer, not to the homeowner, which is common in change-out programs. This enables the consumer to get the discount immediately at time of payment. Participating retailers must promise not increase the price of stoves or installations for customers using the program. And MassCEC promises to pay the rebate to the Stove Professional within thirty (30) days. Another notable feature of the MassCEC program is its generous rebate levels for families that are well above the poverty line, but below the median income of Massachusetts families. Families are eligible for the higher rebate amounts if they earn 80% of the median income that is $87,000 for a family of four and $59,000 for a family of two. “We wanted to be able to drive benefits towards more people who really need assistance in the up-front capital costs,” said Peter McPhee from MassCEC. Incomes are much higher in the Boston urban area than in the rest of the more rural state, so a majority of families will be eligible for the higher rebates in more rural areas where demand for wood and pellet heat is highest. In the western Mass county of Berkshire, the median family income is about $50,000. Total project costs are estimated to be an average of $3,000 to $4,300. Income eligible families receive between $1,500 and $3,000, or 40% to 100% of project costs.